The famous El Capitan’s Horsetail Falls, in the National Park with the same name offered some very lucky visitors a strange scenery. El Capitan is the largest granite monolith in the world and the waterfall that forms on it offers one of the most spectacular views of the park. An even more astonishing view of the waterfall is created by reflections of sunlight that illuminate the water falling below a certain angle, a very special angle. This view can be rarely seen in a period of about two weeks in late February. To photograph an event so rare, you may need to stick around for weeks, for years in a row. The reason is that the phenomenon depends on a number of quite strict natural conditions that must occur at the same time. And it all depends on pure luck. 1: The first and most important condition is for the waterfall to exist. It is made out of water resulting from melting snow and ice on top of the mountain. It melts between December and January and is quite likely that in late February there is not much snow to melt. 2: It is a highly specific angle at which sunlight must hit the falling water, so the position of the sun is condition #2. This is only possible in late February and at early dusk. If it’s a cloudy day, you only get to see a gray waterfall. Not to mention the crazy unpredictable weather also famous in the park. 3: The 3rd challange is getting an entry permit in the area in winter time, due to the road covered in great snow and dangerous hiking paths. What’s funny is that even though nature already puts on a fantastic fire-water show at Yosemite, the park put on a similar man-made show for almost a century. In the early 1900s, David Curry wanted to attract more campers to his Camp Curry site and he figured falling fire would do the trick. 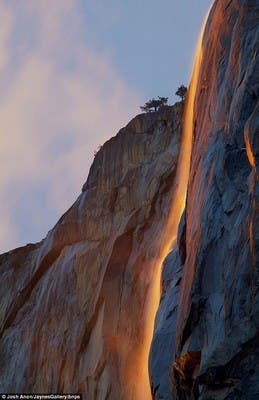 It’d been done in the past — burning bark was poured from the towering Glacier Point cliff creating a lovely cascade of fire-orange flakes down the rock’s face. But Curry made this spectacle a nightly event, and it became quite popular with visitors. For better or for worse, the fire fall tradition was extinguished in 1968, when officials decided that pouring fire from a cliff wasn’t the safest thing for a national park. Fortunately, there were others lucky enough to capture the phenomenon and share it with the world.